Practice, has been a constant companion in my life as an Indian classical dancer. ‘Practice!’ is also the one word I use most, as a teacher of Bharatanatyam; for both the young student in training and the established performer. Eager to facilitate an engaging and exciting practice at home option and bridge the gap between classroom training and home rehearsals, we conceived Nātyārambha, a first of its kind Bharatanatyam practice app. Nātyārambha is interactive, comes with detailed guidance, and a choice of practice options. Inspired by the digital initiatives of the Government, Nātyārambha, that intersects at the crossroads of tradition and technology, is our offering to the world of Bharatanatyam dancers, to help hone their talent, skill and training into excellence and perfection. We hope with Nātyārambha you will be able to practice like never before! Nātyārambha is easy for beginners, yet powerful for pros. While it is an easy tool for beginners to learn and practice, Nātyārambha is also an aid for pros to perfect and take their skills to the next level. While Nātyārambha bootstraps you with you a wide range of handpicked routines tailored to all levels, it also allows you to create your own routine for that perfect personalized practice session. Whether you are a student or a teacher, Nātyārambha lets you share the personal routines you created with others. All that it takes is your favourite device and a little bit of space to stretch your limbs. Nātyārambha on and practice on. No excuses please! All Nātyārambha practice routines and an UNLIMITED number of personalized practice routines. What are people saying about Nātyārambha? Nātyārambha is an admirable app to learn Bharatanatyam, one of the richest classical dance styles of India. Keeping in step with contemporary lifestyle and demands on time, the earlier tradition of learning from Guru is fast becoming extinct. Although there are several reputed institutions and schools teaching Bharatanatyam in India and abroad, the necessity for constant guidance was felt since past few decades as more and more aspiring dancers had to discontinue regular classes to travel away for education, job or marriage. Therefore this app has come as a blessing at the right moment which promises to become teacher, friend and inspirer to dancers and even for those who may benefit as rasikas. Dr. Ananda Shankar Jayant deserves unstinted high praise for pouring her knowledge, expertise and experience in this project so lovingly developed over 4 years of hard work. Her own grounding is in Kalakshetra style of Bharatanatyam yet she has succeeded in projecting a convincing methodology for all ages cutting across languages, gender and nationality. I wish her unique endeavour great success in the service of Goddess Saraswati, presiding deity of knowledge, wisdom and arts. ANANDA SHANKAR JAYANT, one of the prominent alumni of KALAKSHETRA, has come out with a unique, innovative, and imaginative web system titled NĀTYĀRAMBHA. Unlike a web class, this will enable every practitioner of Bharatanātyam, irrespective of their style differences to practice, remember and improve their total standard of dancing. The application is very easy for both teachers and students to practice with inspiring musical accompaniments. I recommend every Bharatanātyam artiste to subscribe to this new innovative and meticulously crafted web system by a stalwart. This is the age of the app. And the app is what all youngsters gravitate towards. In addition, it is a fast life that they lead with numerous pressures and preoccupations, finding very little time to practice with the Acharya on a daily basis, as did our generation. Geographical restrictions too, sometimes augment this problem. Given this scenario, natyarambha offers a readymade tool for students of natyam to keep essential practice going. Keeping in sync with times, Dr. Ananda Shankar Jayant has shown farsightedness in developing this app. With Bharatanatyam now a global form, it is timely for technology to link with art for a larger purpose. From Baku to Barcelona, dancers of all shapes, sizes, nationalities and faiths have embraced Bharatanatyam for its splendour and irresistible charm. Nātyārambha creates the platform to synergise practice, knowledge, rehearsal and a sense of community on a global cyber dance class. Congratulations to ANANDA SHANKAR JAYANT, a fearless dreamer, who has conceived this software to unite us all through time and space into remembering that our bodies in constant practice is how we acknowledge this international sororiety we call DANCE. Shankarananda Kalakshetra, a renowned center for excellence in Bharatanatyam, established in 1979, has forged a reputation for producing outstanding dancers, dedicated teachers,committed scholars and an ensemble that has performed across five continents to critical acclaim. Shankarananda Kalakshetra’s, immersive engagement with the arts, spans creative choreography, traditional and contemporary dance productions, signature national festivals, academic dance conferences, in depth publications and arts education. Nātyārambha is Shankarananda Kalakshetra’s latest arts education initiative. 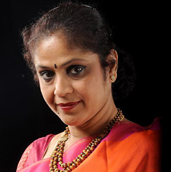 Dr Ananda Shankar Jayant, the Artistic Director of Shankarananda Kalakshetra, is celebrated as one of India’s most eminent and renowned classical dancer, choreographer and dance scholar. With an impeccable training in Bharatanatyam from Kalakshetra, Ananda a much loved Guru, brings to Nātyārambha, four decades of experience, of teaching Bharatanatyam to young aspirants at Shankarananda Kalakshetra. For her contribution to the field of classical art, she was conferred the "Padma Shri" (India’s 4 th highest civilian award) and the Sangeet Natak Akademi Puraskar for Bharatanatyam. Ananda inhabits the worlds of administration, academics, technology and the arts; straddling them with equal ease. Nātyārambha, is Ananda’s offering to the world of Bharatanatyam dancers, to help hone their talent, skill and training into excellence and perfection. Heading Project Nātyārambha is Sneha Magapu, bringing a unique combination of art and technology, treading the two tracks of being a Bharatanatyam dancer and a product manager at a leading software company. On the lookout for ways to make her two worlds meet, and synergising her entrepreneurial spirit, technical background and love for the art form, Sneha, spearheads the Nātyārambha project, and is excited about the immense possibilities and opportunities, that technology can now enable for the many performing arts of India.